Sinhaputhra Finance PLC is aiming at amassing a lending portfolio of Rs. nine billion in next three years. This would be a 300 percent increase of the current position. 2011. Mobilization of deposits too was up to the mark with a 30 percent growth and to date Sinhaputhara Finance able to secure Rs. three billion. The leasing and hire purchase discernments increased by 170 percent.Commenting on the Hybrid market he said that they were one of the pioneers in imports when the vehicles were introduced and still maintains a high profile in this area. 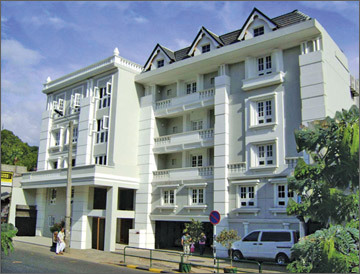 He said that their new building in Kandy which was opened last year today stands as an icon in Kandy. “The new complex which has won acclaim from several town planning authorities for its heritage architecture has given you an asset which will increase in value,” he said. Parts of the 33,000 square foot complex have been given out on lease and on revenue share basis to an educational institute and business process outsourcing company. The conference halls have been used by a wide range of institutes and associations for their functions. “We hope to maintain these public spaces such as the twin auditoriums and a roof top terrace now under gazebo cover to benefit the company in terms of a wider public patronage resulting in greater visibility of our services,” he said. At a micro level Sinhaputhra ensured a profit after tax, of Rs. 26.9 million earning Rs. 4.28 per share against Rs. 1.23 the previous year according to the last annual report. This was a significant 247% increase in performance. The company attracted fresh public deposits in excess of Rs.1,226 million and a net growth of Rs. 445 million during the year displaying the goodwill it has acquired over the last thirty three years in financial service. During the period the company with a Rs. 3.8 billion asset base enhanced their Equity to Rs. 469 million.